Aunt Lizzie gave Samantha a Mr. Potato Head family for her birthday last year. She really likes it. Lately, when she’s finished dressing them up, she’ll line them all up and tell me to take a picture. Each one has a name (Mommy, Daddy, Sam and Ellie). We went to the McWane Science Center recently where they had a Mr. Potato Head exhibit. With all the Toy Story 3 stuff, Mr. 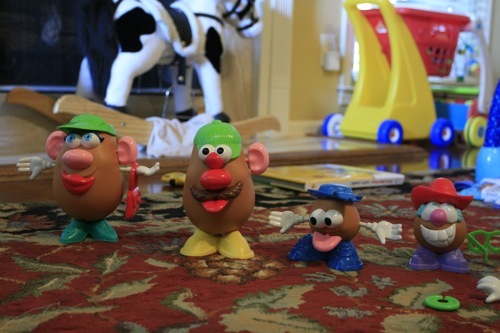 Potato Head seems everywhere. Here are some of her creations. That is just fabulous. Good work Sam! Yay, I’m glad she likes them. 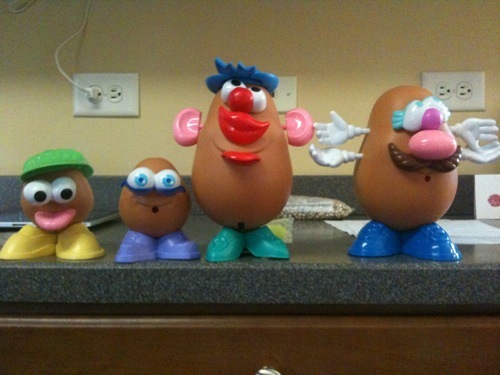 She’s made some very creative potato families. That’s so cute. We have a couple, but they don’t get played with much. I guess because they don’t have wheels.